Sarri’s chase after this £60m star puts Callum Hudson-Odoi’s future at risk! If reports making headlines in the transfer media are anything to believe, Chelsea might end up signing £60m-rated youngster Christian Pulisic from Borussia Dortmund in January. The USA sensation has fallen down the pecking order at the Westfalenstadion Stadium and he’s finding game time too hard to get. Young England international, who recently made his debut for the Three Lions, Jadon Sancho has pushed him out of the team’s first XI with his brilliant and consistent performance. 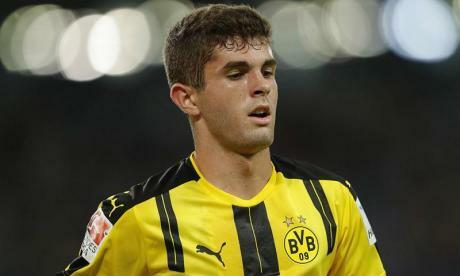 Pulisic is now set to dump the Bundesliga side in January as he begins his search for a new club where his potentials would be fully maximized. Maurizio Sarri is more than ready to capture the youngster’s signature as soon as the winter market commences. The former Napoli manager isn’t convinced with the results he has gotten from his strikers so far this season, therefore, he hopes to add the 20-year-old to his team as part of his January reinforcement. Though the Blues are yet to enter into any negotiation with Borussia Dortmund, the Daily Mirror are claiming that Bundesliga giants won’t sanction Pulisic’s switch to Stamford Bridge unless Maurizio Sarri meets their asking price of £60m. Considering Sarri’s determination and desperation to have a free-scoring team, it won’t be surprising to see Abramovich release such fund so as to complete the player’s signature. Callum Hudson-Odoi is an exciting young winger who has progressed through the ranks at Stamford Bridge. The 18-year-old is a product of the Blues academy but his rise to fame have been slowed down under Maurizio Sarri. The Italian manager shouldn’t be blamed for his misfortune anyway, the Blues aren’t known for giving their academy products much time with the senior squad. So far, Hudson-Odoi is yet to make any first-team appearance in the League but only has four appearances in Europa League competition. Sarri’s unending chase after Pulisic service is a confirmation that Hudson-Odoi is not rated by the Italian tactician. Should the Blues finally win the race for the Borussia Dortmund’s winger, Hudson-Odoi — who is still struggling for minutes — would be pushed down the pecking order or would be condemned to feature with the U-23 team. To avoid such retrogression, he could be forced to end his longtime partnership with the West London outfits in January. It is believed, as reported by Daily Mail, that host of European clubs are eyeing a possible move for the youngster. Bayern Munich, RB Leipzig and Monaco are all linked with his services in the upcoming transfer market. A move to struggling Monaco looks very likely to occur as the French side desperately need some sought of inspiration after a woeful first half of the campaign.